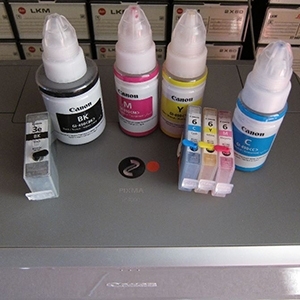 Discussion in 'Epson InkJet Printers' started by Paul W., Apr 14, 2019. The rubber feed roller (it's round but has a flat side) doesn't always grab the paper. (I'm using Red River Aurora Art Natural, 285 gsm.) What has worked until lately is spraying a fine mist of distilled water on a 1" wide foam rubber paint brush, then holding the brush against the roller as I activate the feed. Then I'll hold the dry side of the brush against the wheel and activate the feed again. Finally, I find I have to let the roller dry about 3-4 minutes before I can get a successful feed. But - I can only get one or two photographs to print before I need to repeat my process. BTW, my inkset is the Eb6 carbon ink mix as developed by Paul Roark. If cleaning the pick-up roller with water is no longer sufficient then a special rubber roller restorer might help. I have successfully used the AF Platenclene. The link to the product is to a Danish seller but the product is available in many countries. If cleaning using a special cleaner does not restore the grip of the roller, then you may need to replace the roller. This post has a link and an instruction for downloading a service manual I think applies to your printer. And here is a parts catalog. Maybe this is the roller assembly to buy? Excellent, PeterBJ, thank you. A wealth of information and contacts for further help. I found the pick-up roller easily, but it looks like you have to buy a whole assembly. But I'll try that rubber roller restorer first. If you try the rubber roller restorer, please report your results. Position 704 shows the roller shaft with a separate rubber ring. I think the ring should be sold separately. Thanks for explanation of the parts catalog, PeterPJ. And if Pat is correct, it would be very difficult to obtain the rubber ring. I'm going to put this approach aside for a while, no offense, but I've discovered something in the meantime. I learned that my foam paint brush doesn't do a very thorough job of cleaning the entire roller. The brush doesn't reach the whole roller. On a hunch I folded up a small square of paper towel and damped it with distilled water. Then I activated the feed and as the roller rotated I cleaned a side (or sides) that the paint brush somehow didn't reach. I loaded a sheet of paper and it was picked up immediately and my photo printed without a hitch. I'll keep fine tuning this roller cleaning approach and report back. BTW yesterday I called a friend who runs a copy machine repair service and I know he uses a roller cleaner, what is it, a spray? I'll see if he'll let me try a can. Thanks for the feed-back. I'm glad to hear that cleaning with water did the job. If the roller can be successfully cleaned with water the surface is not degraded, only covered in paper dust. As recommended by HP this can be removed by cleaning with a rag moistened or wetted with warm, not hot, water. HP also warns against using alcohols and other solvents that could damage the roller. The rubber roller restorers contain a mixture of special solvents to only remove a degraded layer of rubber from the roller. The restorer I bought came in a 100 ml pump spray can. The way to use the restorer is to spray on a rag and then wipe the roller with the rag. Don't spray into the printer. See this video. It's been a long day, and I didn't try any printing till I got home. But - when I ran two prints, both loaded without a hitch. Before I discovered the problem was due to not cleaning the entire circumference of the rubber roller, I wouldn't have been able to print so easily, without any problems. Turned out be so simple. I need to look for simple solutions more often when dealing with computer/printer problems!